Joe Smith Farms, Inc. is a family-owned and managed greenhouse operation. We were established in 1975, when Joe took the operation over from his father, Elton Smith. Joe, and his family, have been in the nursery industry their entire lives - not only in wholesale and growing, but retail as well. Whether you are on a mission to find that perfect plant, that blooming flower or simply just enjoying the day; we invite you to come on out, bring a picnic lunch and enjoy nature here on our farm. See the native and exotic birds, black squirrels playing and skittering, and listen to the music that we play to brighten moods. 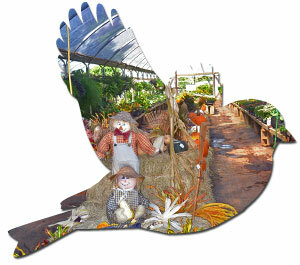 Enjoy the environment while we tend to the Garden Center and remember, our staff is never far away. We would be glad to help you pick out a plant, design a flower bed, or even landscape your yard. Let us help you on any project that you may have.
. Copyright © 2018 joesmithfarms.com. All Rights Reserved.